This started out as an inspired-by-“Ghost Mine”-via-article-in-Ruralite follow-up to 29 Sep 2013’s “Chinese Food for Thought,” where “Ghost Mine” is a series shot in the Sumpter area and airing one more week on the Syfy Channel and Ruralite is the magazine put out by Oregon Trail Electric. The article writer had equated Crescent Mine with Buckeye Mine, which I had done at one time myself until I found out it wasn’t quite true. Then I started looking at the maps and getting distracted by letters and mine claims. I haven’t had frequent access to hundred-year-old documents and the WOW factor just carried me away. 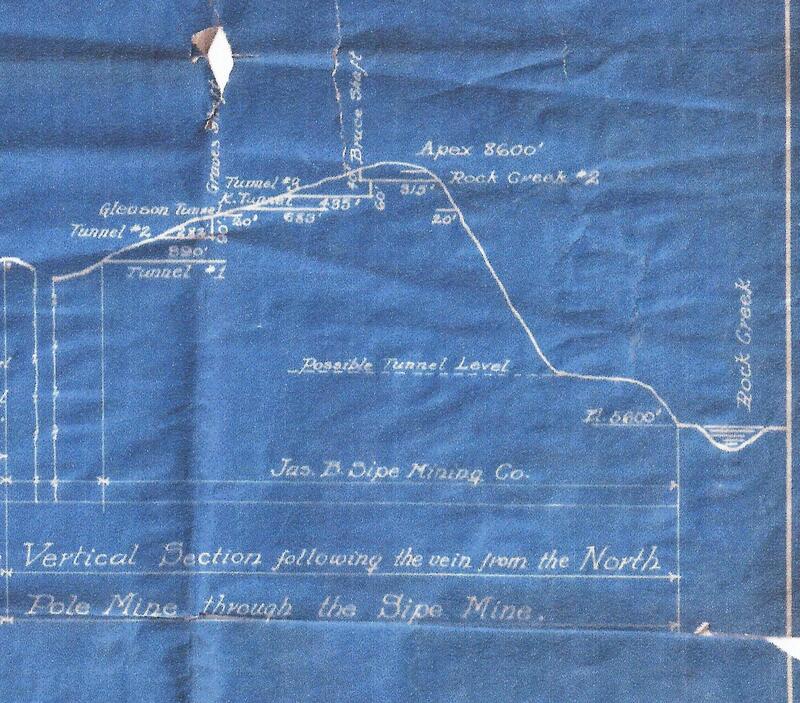 I am limiting myself to two maps in this article, but hope to delve into an Indenture “entered into this 13th, [sic] day of December, A. D. 1906,” and a “Financial Statement of the James B. Sipe Mining Company and General Report of Development Work from June 15th, 1905 to December 15th, 1910” in another article. These and other documents are courtesy of the Sumpter McEwen Masonic Lodge, and how they came to have them is yet another third or fourth story. The Buckeye Mine is actually made up of several different lode claims. I’ve taken to calling it the Buckeye Group to help me remember. Sumpter historian Brooks Hawley called it the Buckeye Group, too. Changes made in location of claims by C.F.K. Jan 1915. 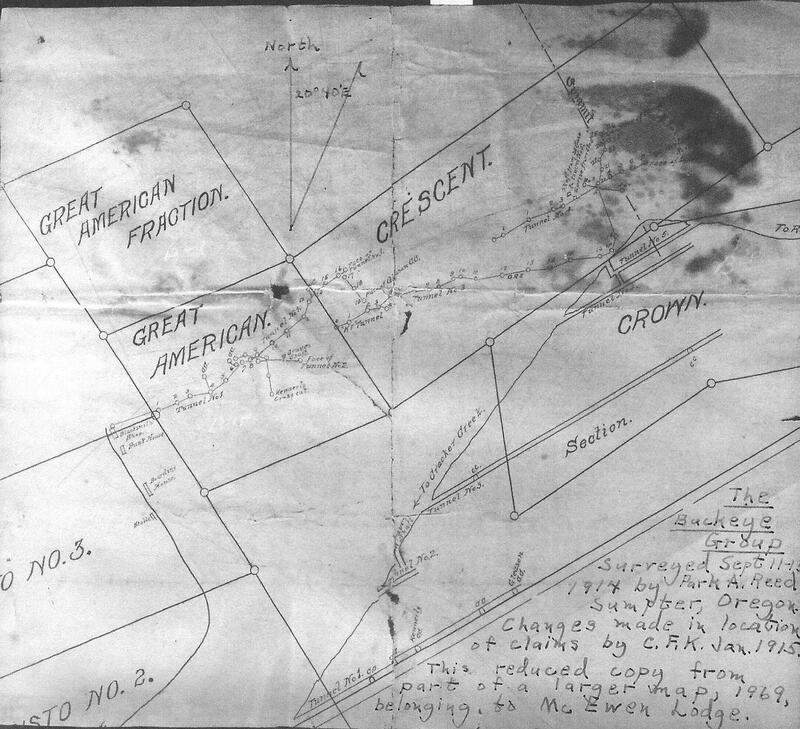 The Crescent and Great American lode claims are seen from above with squiggly lines marking tunnels. There’s a road coming up from the lower left and curving across slope to be parallel to the ridge line and end where Great American/Buckeye Tunnel No. 1 goes into the mountain. On this road, there were a stable, a boarding house, a bunk house, and a blacksmith’s shop. The blacksmith’s shop is closest to the tunnel opening and the stable is farthest from it and the only building on the downhill side of the road. Lo and behold, in the side view you can also find the Kennerly CC marked on Tunnel No. 1 and Grave’s Shaft dropping down into Tunnel No. 2. Light bulbs go on. The road in “Ghost Mine” went up to the opening of Tunnel No. 4, in the Crescent rectangle, high on the mountain side. The rise found in the middle of the second season of the series is the shaft that connected Tunnel No. 4 to Tunnel No. 5. Crescent’s Tunnel No. 5 lets a person clamber up onto the mountain slope to look southwest over the Cracker Creek drainage toward Sumpter Valley. Take the easier horizontal exit from Tunnel No. 5 and you’re looking northeast over the Rock Creek drainage toward Baker Valley. A mine tunnel that goes all the way through the mountain right here in our little ol’ neck of the woods! From above, you can see that Tunnel No. 3 curved as it reached the boundary between Crescent and Crown and headed almost due north until it ended close to directly under the ridge line. Imagine dropping a deep shaft from Tunnel No. 4 and intersecting Tunnel No. 3 near its unnamed crosscut. Probably not practical from a mining point of view, but awful fun from the gee-whiz angle. It looks like a long way down. How far would it be? The piece of paper is beat up, but still quite legible. The top of the mountain is at 8600’. Tunnel No. 5 is called Rock Creek #2 and is 315’ long. The shaft from the surface down to No. 5 is called Bruce Shaft and is 40’ deep. The shaft from No. 5 down to Tunnel No. 4—Tunnel #3 on this map—is 60’. The different labeling makes me wonder if the blue map includes tunnels from the Crown, whereas the cross-section above has only Great American and Crescent. Tunnel #1 seems to be the same as Tunnel No. 1, and it’s 590’ long. Tunnel #2 and Tunnel No. 2 both have Grave’s Shaft dropping down into them. The tunnel is 282’ long and the shaft is 90’ deep. On the blue map, a 20’ long Gleason Tunnel exists from off the top of Grave’s Shaft. This tunnel doesn’t appear on the white map. The 683’ long K Tunnel of the blue map looks to be Tunnel No. 3 from the white map. In the financial report, I do recall seeing a reference to K Tunnel. The blue map also shows two unnamed, short tunnels on the Rock Creek side of the mountain, one above and one 20’ long one below Rock Creek #2. To get back to what I was asking myself, it looks like Tunnel No. 3/K Tunnel got a lot longer after 1901 and that dropping a shaft down to it would be about 90′, except nothing seems to be drawn to scale, so I don’t really know. As I’ve said before, so many distractions. And so many questions. What’s really intriguing is what I’m not showing you: the other three-fifths of the blue map, that actually has cross-hatching for the mines in “Vertical Section following the vein from the North Pole Mine to the Golconda Mine.” Lucky for you, those mines have nothing to do with “Ghost Mine,” so I’m not wandering into that territory.